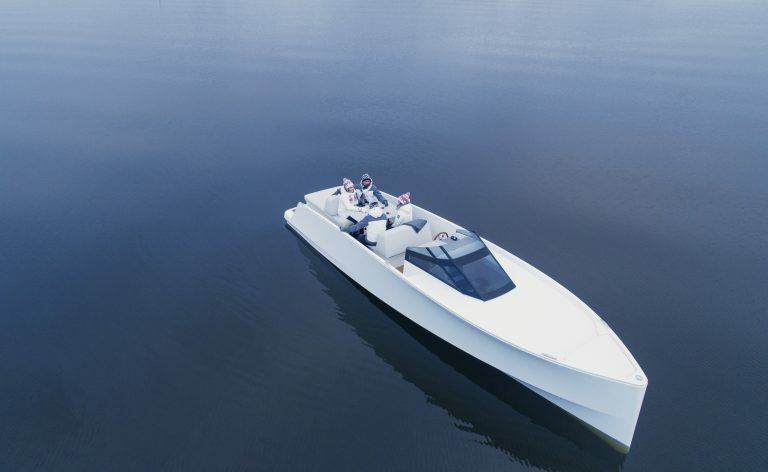 Q Yachts Ltd was established in 2015 in Finland and it designs luxury electric boats. There are two main partners that have participated in the product development of the boats; Oceanvolt Ltd, which is responsible for the electric propulsion systems, and Navia Design Ltd, which is responsible for the design. Oceanvolt was established in 2004 and it employs 16 people in Finland. The parent company of Navia Design, Aivan Ltd, employs 35 people. Software working seamlessly and flexibly with every partner was used to help with the design of the boats – SOLIDWORKS. 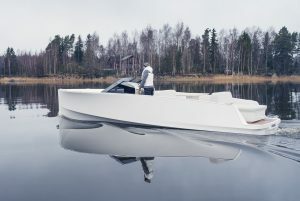 A new type of masterpiece has been designed in Finland – an environmentally friendly boat that runs completely on electricity. Extensive cooperation is behind the product development of the boat. Especially four companies stand out in its story – Q Yachts, Oceanvolt, Aivan and Navia Design. The boats marketed under the Q Yachts brand are hand-made in Finland. SOLIDWORKS software, acquired from PLM Group, is used daily to help with the product development process. Everything started with the motor – Janne Kjellman established a company called Oceanvolt and envisioned a silent, fully electric motor. 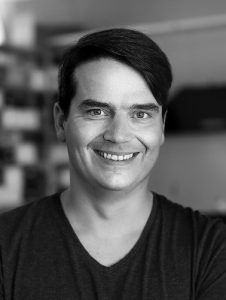 He is currently serving as the Head Designer at Oceanvolt. “The foundation of Oceanvolt is being environmentally friendly. In addition, we want to offer our customers a comprehensive boating experience where it would be as quiet as possible while underway and customers could enjoy all aspects of boating. Sailors feel the dullest part of boating is when starting the diesel motor when approaching the dock. With our motors, this is not necessary. I have worn practically every hat at Oceanvolt and now I carry overall responsibility for the direction our technology is heading in the future. In addition, I serve an information source for entire technical and pre-sales departments. For the entire history of the company, we have delivered electric propulsion solutions for yachts. Currently, nearly all of our products are exported”, he says. Oceanvolt adopted SOLIDWORKS from the very first day and the software was delivered by PLM Group. “We had an external designer, who used the software. This likely contributed to choosing the software. I have a long background in IT and I had used the software a lot. Of all of the design software, SOLIDWORKS has been the most advanced with the most intuitive user interface. I still use the software in my daily work and it has been a preferred tool to work with. In addition, we use SOLIDWORKS Electrical Schematic here at Oceanvolt in order to create electrical drawings for the boats”, Janne continues. Oceanvolt first only made motors for sail boats, but interest was also expressed in motor boats. 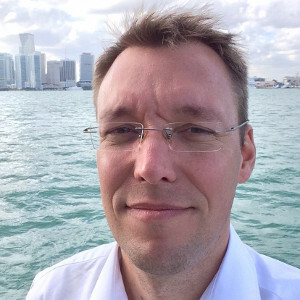 When a suitable partner for the motor boat business was not identified, Janne Kjellman established Q Yachts Ltd in 2015 – the company designs and manufactures motor-powered electric luxury boats. Next, a partner was needed for designing the boat, in order to realise the detailed vision. Navia Design, a design and innovation company that operates as an Aivan Ltd subsidiary, was selected as the partner. “The cooperation between Aivan and especially Navia already began at Oceanvolt already during the second version of the motor, i.e. long before Q Yachts even existed. We needed a designer, so that the motor would not look like it was designed exclusively by engineers”, says Janne. The shared values of all of the actors participating in the design of the boat are sustainable development and being environmentally friendly. In addition, everyone uses the same software as the main design tool. This makes practical cooperation easier. Sharing the drawings and other design information is relatively effortless. In addition, designers are practically free to innovate exactly the types of products they want, as the software adapts to the personal requirements of the design work. “Cooperation is effective when everyone has the same visions and software. The greatest challenge with boat design is time. We are able to simultaneously make changes to the same entities where one is designing the throttle lever while another is designing the fridge, for example. In addition, we are able to work on the design to a higher degree of completion before starting practical implementation. Our cooperation with Navia Design is still on-going. To date, Navia Design has drawn the control equipment and the entire boat for Q Yachts”, Janne continues. SOLIDWORKS is seen as highly beneficial software also at Navia Design. “The way of doing things at Oceanvolt and Q Yachts is very modern, which goes well with the thinking in our companies. For example, we want to create uncompromising quality. Therefore, we believe it is acceptable that the high quality is evident in the time spent working on the design. From start to finish, SOLIDWORKS supports our working method. We cooperate with other suppliers in nearly all of our projects and we wish to implement the design work using SOLIDWORKS. This wish is also shared by the customers”, says Antti. 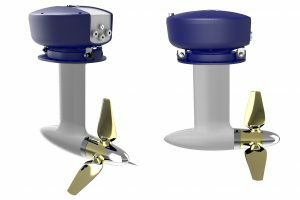 Oceanvolt, Q Yachts, Aivan and Navia Design are satisfied with the SOLIDWORKS solutions acquired from PLM Group and they plan to continue using them in the future. The software supports the vision of all four companies on sustainable development and it allows them to help build a more environmentally friendly world. “Our mission is to advance boating into a world of environmentally friendly values – the trend with boating is to offer larger motors and more power, but this is not good for the environment and we are trying to change this trend. Electric cars have already done a lot of the work for us. Electric motors have been introduced to consumers and as they drive their electric cars to the shore, they are also considering if an electric motor would also be possible in their boats. However, there are a lot of differences between electric cars and boats and the same technology cannot be used in both. For example, acceleration consumes energy with electric cars, but maintaining a steady speed does not. With boating, this market is only now emerging and the development has been a lot slower than one would have ever thought. There is still a lot of potential in the market especially abroad and it is a growing wave. We intend to ride that wave”, concludes Janne.